Discover Your True Inner Self... and Awaken the Power Within! 5 Spiritual books that will change your perspective of reality! Check out these interviews of Amy about the relationship between homeopathy and synchronicity and the the teachings of Gurdjieff and other mystics that were filmed for a movie about consciousness -- Time Is Art. Also: Amy's conversation with Charles Eisenstein: Synchronicity and the Impossible. Can you create the future of your dreams? Are paranormal abilities like seeing into the future or affecting objects with your mind really possible? And how do energetic systems of healing -- like homeopathy and hands-on healing -- actually work? In this exciting new book, former NASA computer scientist Amy Lansky, author of the best-selling book on homeopathy, Impossible Cure (www.impossiblecure.com), takes you on a voyage of discovery to your inner Self. Get ready for an exploration of the esoteric, grounded in an intriguing model of reality based on higher dimensions in space. 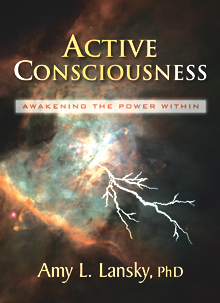 Active Consciousness: Awakening the Power Within is now one of the most exciting, far-ranging, and accessible books available on the topic of consciousness, spirituality, meditation, and the evolution of human awareness. Comprehensive, yet at the same time accessible and personal, this book invites you to not only learn about these mysterious subjects, but to develop the power of active consciousness for yourself. By including a series of exercises and experiments in meditation and self-inquiry, Active Consciousness provides an experience that will transform your life and help you evolve to a new level of awareness. "An excellent "How-To" book for accessing higher levels of order in your life...Active Consciousness does an excellent job of illustrating the ways expanded dimensionality of consciousness might be expected to interact with our 3D conceptualization of the world... When we recognize that higher levels of order contain more information than we ordinarily consider accessible, we have the means by which we can use consciousness actively. Lansky provides numerous examples of ways we can do this, whether through something akin to homeopathic treatments, or through meditation and visualization exercises she provides throughout this book. As Lansky also explains, once we achieve a state of genuine, authentic, deep communication with others, true connection can occur. We can experience who we really and truly are... I especially love the way Lansky includes lots of fun illustrations alongside some of the key points she's making in her book, so you can gain a better idea of how, for example, you can hold in mind a possible future as long as it is possible, and through the process of active consciousness, help ensure that more a enjoyable possible future is attained. Packed with numerous exercises, Active Consciousness makes an excellent guidebook for taking your consciousness to the next level. Highly recommended!" "This book is a gift -- well written, coherent, purposeful and clear. I recommend [it] to all seekers of deeper awareness and consciousness." "An introduction to homeopathy that stands out from the rest." "The finest general introduction to homeopathy I've yet read...This book should be read by everyone interested in homeopathy, from the rank beginner to the seasoned professional. It has something new in it for everyone." "Amy Lansky is a skilled guide to the world of homeopathy." "We have never had this kind of response to an introductory book." "One of the best introductions to homeopathy I've seen. Two thumbs up for Impossible Cure: The Promise of Homeopathy." "Amy Lansky's clear and compelling book is both timely and informative. Highly recommended! "An accessible guide to one of the most mysterious of healing arts." "This book may very well contribute to the transformation of homeopathy from the ugly duckling of medicine to the swan that it deserves to be."